Eritrea appeals to the Security Council to immediately and unconditionally lift the sanctions and terminate the mandate of the Somalia Eritrea Monitoring Group. The following is the full statement that was delivered by Ambassador Girma Asmerom, Permanent Representative of Eritrea to the United Nations, during an informal dialogue with the Security Council Committee Established Pursuant to the UNSC Resolutions 751 (1992) and 1907 (2009), in New York. Eritrea deeply values this informal interaction with the Sanction Committee. In this regard, I would like to thank Ambassador Rafael Darío Ramirez Carreño, Chairman of the Sanctions Committee, for giving my delegation the opportunity to address the Sanctions Committee and for facilitating constructive interaction and dialogue between my Government and the Somalia Eritrea Monitoring Group. I also appreciate the role of the United Nations Secretariat. Let me now proceed to present, very briefly, Eritrea’s views on the SEMG report. Eritrea was provided with conditional access to the SEMG’s current report. This happened by allowing its delegation to visit the UN Secretariat to read the document and take notes on the spot. As we had emphasized in previous occasions, Eritrea finds this procedure awkward and inappropriate by all standards. Eritrea is a concerned – indeed the accused – party in this whole undertaking. As such, it needs and deserves unfettered access to full SEMG reports in real time. This repeated and cumbersome pattern of limiting or denying access to Eritrea to the SEMG reports is incompatible with the legal principle of ‘equality of arms’. It also violates the principle of transparency. The main reasons for imposing unjust sanctions against Eritrea were its alleged “support to al-Shabaab in Somalia” and “the border dispute between Eritrea and Djibouti” in the context of their implication to regional and international peace and security. Nothing less, nothing more! These issues have long been proven as untenable and non-existent. The SEMG, both in its previous report as well as in the current one, has concluded, clearly and unequivocally, that it “did not find any evidence of Eritrea’s support to al-Shabaab” in Somalia. The Djibouti Eritrea issue does not constitute a threat to regional and international peace and security; both in terms of the magnitude of the problem and also because the UN Security Council has endorsed the ongoing mediation process by the Emir of Qatar. The Qatari mediation process was agreed and signed by the Presidents of Eritrea and Djibouti. Eritrea is engaged in good faith, and remains fully committed to, the Qatari mediation process. It must be underlined that more than 200 Qatari troops are deployed at the Eritrea Djibouti common border. In view of the fact that the two reasons for the imposition of sanctions against Eritrea have no validity whatsoever, the continuation of the sanctions is unjustifiable and unwarranted. Eritrea appeals to the members of the UN Security Council to immediately and unconditionally lift the unjust sanctionsand terminate the mandate of the SEMG in relation to Eritrea. UN Security Council Working Group decisions require expert panels to rely on verified information and documents. They must ensure that “their assertions are corroborated by solid information and that their findings are substantiated by credible sources“. Has this been the case with the SEMG reports on Eritrea? Any objective reader would agree that the SEMG routinely dwells on issues beyond its mandate. This predilection requires urgent redress. Furthermore, the methods used to gather information violate the basic principles of the UNSC working methods spelled out above. The SEMG itself admits that in compiling the report it has relied on “defectors”, “unnamed diplomats”, and “authorities in East African country”, and, “confidential notes submitted by regional authorities”. Who are these nameless and faceless individuals? The SEMG has, rather imprudently, included in its report forged and fabricated information that it has received from countries such as Ethiopia and Djibouti. What would one expect from these countries that openly pursue sinister agendas against Eritrea? This approach does not only violate the principles of reporting concrete and verifiable evidence, but it also politicizes the issue. More than often, SEMG reports are replete with hearsay, insinuation, outright factual misrepresentations, conjectures, unsubstantiated accusations and unwarranted conclusions. These obvious flaws can only cast doubt on the professionalism and impartiality of the body, and, the validity and credibility of its reports and recommendations. The SEMG itself has unequivocally concluded that Eritrea does not support al-Shabaab in Somalia. The Eritrea-Djibouti dispute does not constitute a threat to regional and international peace and security. As pointed out above, the mediation process agreed by the two Parties is on track while a small contingent of Qatari peacekeepers continues to be deployed at the Eritrean-Djibouti common border. It must also be recognized that Eritrea had deployed its troops from its sovereign territory. It has thus fulfilled the implementation of resolution 1862 both as a gesture of good will and for the sake of peace and security. As intimated earlier, it must also be pointed out that the mediation process is not under the SEMG’s mandate. Eritrea has not violated the arms embargo and the SEMG acknowledges that it did not find any credible and verifiable information that Eritrea has violated the arms embargo. 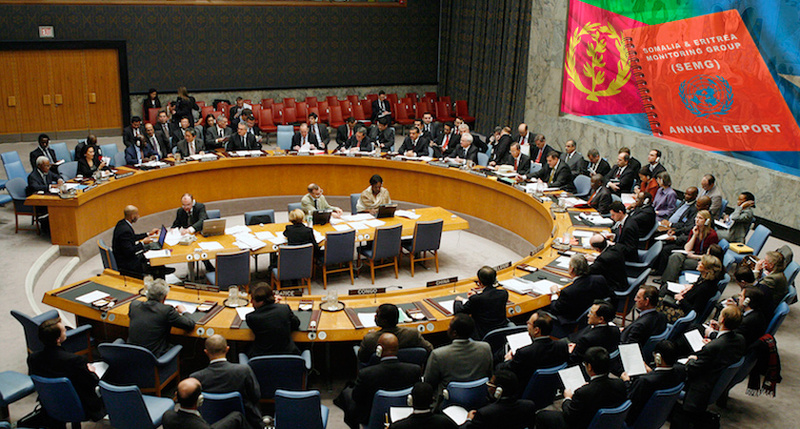 UNSC resolution does not restrict Eritrea from collecting 2% RRT from Eritreans in the Diaspora. Eritrea has not and is not using “extortion, intimidation, threat of violence, fraud and illicit means” in the collection of 2% Reconstruction and Rehabilitation Tax (RRT). Countries such as Sweden, UK, Switzerland, and Germany have also confirmed to the SEMG that Eritrea’s collection of 2% RRT from Eritreans in Diaspora is consistent with international law and that “no local laws or provisions of Resolution 2023 (2011) had been broken or violated”. The 2% RRT is collected in a transparent manner on the basis of Proclamations No 17/1991 and 67/1995 which is already in the hands of the SEMG. Tax evasion is a serious felony punishable by law – mostly entailing imprisonment – in all UN Member States. These punitive measures have never been construed as intimidation or scare tactics for any country before. In the event, Eritrea fails to understand and is intrigued why the SEMG considers Eritrea’s legal administrative measures, that are taken against the 2% RRT evasion, and that do not even include imprisonment, as “intimidation or scare tactics”. The revenue collected through the 2% RRT is not substantial and is properly and effectively utilized for supporting Martyr’s families and war disabled veterans. It is an alternative source of financing for development and consistent with the African Union Summit decision that calls for the involvement of the African Diaspora in the social, political, cultural and economic development of the countries of origin. Eritrea should be, emulated, commended and encouraged; not punished on account of this act. For the record, the annual revenue collected from the 2% RRT is no more than 11million US dollars, while the annual expenditure to support families of martyrs and the disabled veterans is more than 27 million US dollars. Concerning the mining sector, Eritrea has not and is not utilizing its mining revenues for activities that violate UN Security Council Resolutions. As a matter of fact, the annual revenues that the government earns from the mining sector can barely cover 40% of Government’s annual expenditure for public programmes of education, health and food security. The SEMG’s claim that it did not “obtain Eritrea’s full cooperation” is not only factually wrong but unwarranted and must be corrected. For the record, Eritrea has fully cooperated with the SEMG in good faith from day one. It must be recalled that the SEMG had visited Eritrea twice in previous times and held extensive meeting with several GOE officials. In addition, the SEMG met three times with Mr. Yemane Ghebreab, the Political Adviser to the President, in Stockholm, Paris and Cairo respectively. The SEMG has held three video conferences with me as Special Envoy of the President and Permanent Representative of Eritrea to the United Nations, in 2014 and 2015. Several meetings have also taken place between the SEMG and the Eritrean Mission in New York. Eritrea participated in good faith in two video conferences that were facilitated by the Chairman of the Committee on 31 March and 21 August 2015. Each session took more than two hours of interaction. Eritrea has submitted comprehensive and timely written responses on 01 April and 04 September 2015 to the questions raised by the SEMG. Eritrea wishes to underline that some issues raised by the SEMG, such as the conflict between Ethiopia and Eritrea, the situation in Yemen, as well as the request for budget documents and investment agreements constitute infringement on Eritrea’s sovereignty. Still, Eritrea has given explicit and definitive responses to the SEMG, stressing that these “matters are outside its remit”. These responses are definitive, legitimate and legal answers that should be duly acknowledged and properly reflected in the report. Eritrea has also engaged constructively with the Group through its Permanent Mission in New York. The SEMG did not stick to its mandate. The SEMG is mandated to investigate whether Eritrea is supporting Al-Shebaab in Somalia and whether the Eritrea and Djibouti border dispute is a threat to regional and international peace and security. But to maintain the unjust sanctions against Eritrea, the SEMG is attempting to move the goalpost by dealing with issues that are outside its mandate. Despite Eritrea’s repeated appeal to the United Nations Security Council to guide the SEMG to stick to its mandate, the Group unfortunately continues to present reports which are outside its mandate. Its lopsided preoccupation on the Eritrea and Ethiopia conflict, the situation in Yemen, as well as the internal situation of Eritrea and Eritrea’s relationship with international investors and global partners are cases in point. In all these instances, the SEMG’s skewed approach totally ignores and disregards context, perspective and potential ramifications. A) The Eritrea-Ethiopia conflict is not within the purview of the SEMG. It is an issue of the occupied and the occupier. Ethiopia is occupying sovereign Eritrean territory, including the town of Badme. The SEMG cannot be oblivious to this reality and address this grave matter in an arbitrary and lop-sided manner. Furthermore, Ethiopia publicly admits that it is hosting, financing, arming and training several subversive Eritrean groups that intermittently unleash terrorist forays against the people of Eritrea. More recently, on 07 July 2015, the Ethiopian Prime Minister stated, in his address to the Parliament, that “Ethiopia will take military action against Eritrea”. The use or threat of use of force against any country, big or small, is a violation of the UN Charter and international law. These acts should be condemned and not tolerated by the Security Council. Therefore, the Council must reject the SEMG’s selective report on the Eritrea Ethiopia conflict. Eritrea has long maintained that the UN Security Council should shoulder its responsibilities on Ethiopia’s flagrant violation of international law, the Algiers Peace Agreement and the final and binding decision of the Eritrea-Ethiopia Boundary Commission. In Eritrea’s view, this matter must be broached in a different forum under a different agenda item for the Security Council to compel Ethiopia to fulfill its treaty obligations; and, to respect the UN Charter by withdrawing from sovereign Eritrean territories, including the town of Badme. B) The situation in Yemen: the SEMG is again dealing with an issue that is completely outside its mandate. Its hasty report is, sadly, an amalgam of outright falsehoods, insinuations, insults and inaccuracies. As it is well-known, Eritrea shares a long maritime boundary in the Red Sea with numerous countries. In the strait of Bab el-Mandab, Eritrea has continuous maritime boundaries with Djibouti and Yemen. In this sense, it is directly affected by economic, political and military developments in the region. But these matters do not fall within the purview of the SEMG and cannot be subject of its sloppy reporting. Both UN Security Council resolutions and the UN Charter “reaffirm the respect for sovereignty, territorial integrity, political independence and unity of Eritrea”. However, in violation of the UN Charter and in breach of Eritrea’s sovereign rights, the Group resorts to intrusive innuendos on the internal political, economic and social situation in Eritrea. The report completely misrepresents the Eritrean political and economic system. It goes to great lengths to insult and denigrate the Eritrean financial system. It misrepresents, rather gratuitously, the financial sector, the roles of the government, the People’s Front for Democracy and Justice (PFDJ) and the Eritrean Defense Forces. It requests to scrutinize investment agreements that the GOE has entered with foreign companies and rather foolishly recommends that Eritrea’s international development partners – including the European Union and African Development Bank to review and reconsider their development cooperation with Eritrea. It is worth mentioning that this sinister recommendation was included in the first draft resolution that was tabled in 2011 and rejected by members of the Council. The list is long. (a) “There is no evidence that Eritrea is supporting al-Shabaab in Somalia”. With all its shortcomings, the SEMG asserts this cardinal fact without equivocation. (b) As emphasized above, the Eritrea-Djibouti dispute is under a mediation process and does not, otherwise, constitute a threat to regional and international peace and security. (c) In the event, the two reasons for imposing unjust sanctions on Eritrea are non-existent. As such, lifting the sanctions immediately and unconditionally can only be the right course of action by the UNSC. The logical corollary of this action is the termination of the mandate of the SEMG. And in any case, as the SEMG has concluded its work concerning Eritrea, the Eritrean Government strongly feels that the SEMG has outlived its purpose and its mandate should not be renewed. A few days ago on the 25thof September, we adopted the historic post 2015 development agenda. All of us collectively pledged to respect and implement the principle that “no country or people should be left behind“. Unjust sanctions definitely have negative implications on the social and economic development of the Eritrean people, in particular women and children. It also goes against the letter and spirit of the poverty eradication agenda. Let us practice what we have pledged: “No one should be left behind“. Eritrea, thus, appeals to the UN Security Council to immediately and unconditionally lift the unjust sanctions. Eritrea, with 1,200 kilometers of coastline and more than 350 islands, located in the volatile Horn of Africa and the Red Sea Region, with 50% Christian and 50% Moslem population, is a peaceful and harmonious country. Any development or activity concerning the issue of peace and security in the Horn of Africa and Red Sea Region directly affects Eritrea’s security and economic development. As a member of the United Nations, Eritrea is fully committed to the UN Security Council resolutions to fight global terrorism and extremism. Therefore, for Eritrea to effectively contribute to the fight against global terrorism and extremism and to protect its sovereignty and territorial waters, it is paramount for the UN Security Council to unconditionally and immediately lift the unjust sanction. Technical and procedural matters should not be used as a pretext to maintain the sanctions. The visit or lack of visit by the Monitoring Group to Eritrea should not be used as an excuse for the continuation of the sanctions. There is no purpose or added value that will be gained from SEMG’s visit to Eritrea. Lifting the unjust sanctions will enhance peace and security in the Horn of Africa and the Red Sea Region. On the other hand, the maintenance of the sanctions can only be a recipe for disaster and chaos. In the event, Eritrea appeals, once again, to the Security Council to terminate the mandate of the SEMG and to immediately and unconditionally lift the sanctions.